Engines be targetted industrial customers without EU export issues. Contact us for pricing and delivery time. The JetCat PRO turbines offer maximum integration and maximum installation. All necessary system facilities for turbine operation are completely integrated under the turbine hood. In addition to the supply battery, the fuel tank and the control signals, no further external subsystems are required! The control signals are output on a data cable terminated with a 15-pin SUB-D connector. The power supply is optional via the power cable with XT60 plug for direct battery connection. The standard P300 / P400-PRO turbines have a "normal" starter motor, no generator (to save costs, eg for hobby applications). With our "JetCat-PRO" interface, the turbines can be easily used for RC model applications. The PRO interface has already integrated the full functionality of our telemetry adapter! 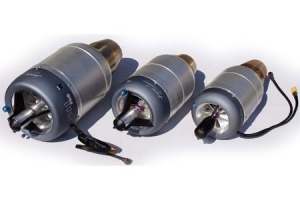 These versions consist of a brushless and non-contact starter / generator system. The generator is "soft" coupled, ie it rotates at a lower speed than the turbine shaft itself (patent pending). A built - in and integrated DC / DC power converter with additional charge control allows buffering / recharging of the turbine battery. The charging system is able to supply charge energy to the turbine battery already at idle. The electrical power of this charging system is about 85W. The "soft" coupling of the generator limits the power output. This version consists of a brushless and non-contact starter / generator. The generator is "hard" coupled to the turbine shaft (but there is no mechanical contact), ie it rotates at the same speed as the turbine. This configuration allows a much higher output of the generator (900W!). This version is also supplied with an unregulated 3-phase AC power supply. The three-phase voltage varies proportionally with the turbine speed. Typically, the measured DC voltage at idle is about 12V / 7.5A (33,000 RPM) and 35V / 22A (100,000 RPM) when coupled with a 1.5 ohm resistor behind a rectifier network (6x high power Schottky diodes ) is loaded. The JetCat P500-PRO turbines are only available as PRO-GL or PRO-GH versions.